My Titan does not look happy about my fashion choices. For the most part, Destiny 2 makes it easier to level up than its predecessor did. If you’re rushing to raise your Power level to prepare for next week’s raid, however, you’ll want to understand how legendary mods can help you climb faster. Destiny 2 works similarly to Destiny in terms of its overall leveling structure. First you earn XP up to the level cap of 20, and after that you focus on your “Power” level, which is an aggregate of the damage or defense numbers attached to your weapons and armor. New weapons and armor drop according to your current max possible Power level. (That’s a fantastic change over the first game, which dropped gear according to your equipped Power level.) Because of that, for the most part, you can kinda just hang on to your most powerful items and be guaranteed a smooth curve ever upward. Well, the curve is smooth to Power level 260, at least. It becomes much steeper after that. It’s generally believed we’ll want to be around 280 to be ready for the raid (Update: on Monday, game director Luke Smith tweeted that the raid will have a power range of 260-280) and those last 20 points are much slower going than the 260 preceding them. Enter legendary mods. See the “5 Defense” attached to it? That means it bumps the item’s Power value up by five. Here’s where things get tricky and, honestly, a little too Destiny 1-era convoluted for my tastes. The item’s actual power number remains five below what it says in your inventory, because the mod is raising it by 5. That means that if you want to get your overall possible number to go as high as possible (thereby getting yourself the best possible drops as you go), you should definitely hang on to any weapon or armor you get that has a legendary mod attached to it. Here’s an example that illustrates why: Say you have two helmets. One is a legendary helmet with a legendary mod, and it’s at power level 268. The other is a blue helmet, which is also at 268. Because of the mod, the legendary helmet’s power level is actually 263. Which means you can infuse the blue helmet into the legendary helmet, even though at first glance they have the same Power number. Doing so will bring your modded legendary helmet’s score up to 268, which the mod will then bring up to 273. So, basically: If one piece of gear has a legendary mod, you can infuse a 268 into another 268 and get a 273. Once my Power level passed around 265, I started paying attention to mods. It definitely made a difference as I made my way through the 70s. 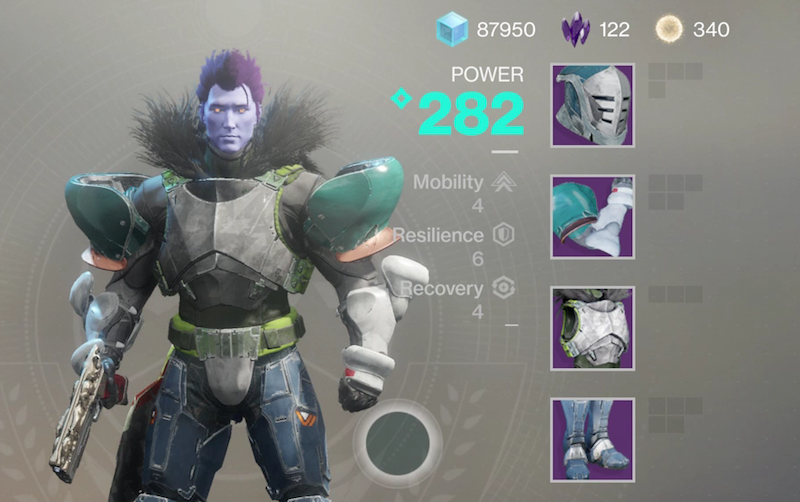 I’m now at 282, which is extra helpful because once you hit 280, you can start to trade lower-level blue mods for more purple Power-raising mods at the gunsmith. Part of me resents that I have to keep track of this kind of thing, since by and large Destiny 2 hasn’t required me to reserve space in my brain for complicated optimization gymnastics. I’m guessing that in a week or two, this kind of tip will be less relevant, since the raid will be more of a known quantity and time won’t be as much of a factor. But if you’re trying to get your Power number as high as possible before Wednesday, I can’t deny that an understanding of legendary mods will help make that happen. I haven’t actually hit a cap for blue items yet. They hit a few soft caps like 260 and 265, but eventually my Power will get high enough that they’ll start to drop above that. I’m hopeful they’ll just keep climbing forever. Blue drops appear to correspond with the legendary drops I get when I rank up a faction or vendor, so those engram drops are also climbing. When I rank up the vanguard or gunsmith now, I get low-270s gear. In general, it seems like blues and legendary engrams drop around 8-10 below my current max Power level. So, I’m at 282 and I’m currently getting blue drops at 271 or 272. If you’re really doing the Power Leveling thing, you should also wait until you’re past 260-265 or so to turn in any Milestones that say they give you “Powerful Rewards.” Those ones go much higher than the ordinary vendor cap, so you want your Power to be as high as possible. Same goes for opening Cayde’s treasure chests, though I actually did those whenever I wanted and I still broke 280 just fine. This should go without saying, but never get rid of an item if it’s your highest Power level in that category! You don’t have to use it to benefit from owning it. Even if it’s a sucky grenade launcher, if it’s higher Power than any other power weapon you have, it’ll raise your overall potential Power, which in turn can affect drops going forward.